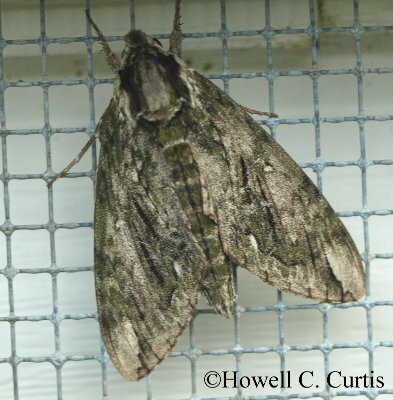 Identification: Forewing is gray with a green tint, dark indistinct wavy lines, and pale gray patches at the wing tip and along the costa. 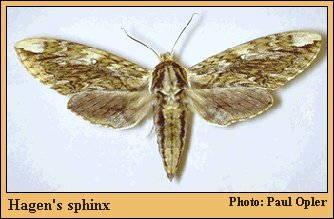 Hindwing is dark grayish brown with paler gray at the base and outer margin. Wing Span: 2 3/4 - 3 5/8 inches (7 - 9.2 cm). Life History: Adults fly at dusk. Flight: . Two flights from April-September; possibly three flights in Missouri from May-October. Caterpillar Hosts: Osage orange (Maclura pomifera). Adult Food: A variety of flowers. Range: Michigan south to Georgia; west to Nebraska, Kansas, Oklahoma, and Texas.